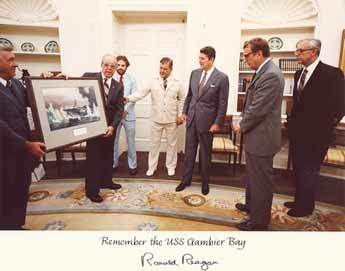 At our ship's reunion in Iowa City, Iowa on July 17-19, 1980, a desire was expressed to present newly-elected President Ronald Reagan with a copy of our book, "The Men of Garnbier Bay," and thus have a visit with him in the Oval Office. I, Norman R. Loats, expressed at that time that I thought we could, have that desire satisfied. 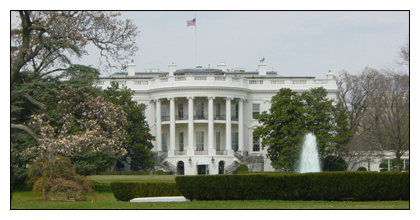 I felt that way because a friend of mine, Robert E. Badham, had been elected to the House of Representatives from California. I knew he was a friend of then, President Ronald Reagan as well, because Badham had served in the State Legislature when Ronald Reagan was Governor of California. 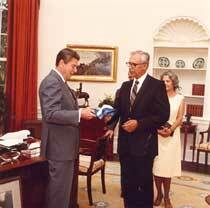 Thus, my commitment was fulfilled, and we met President Ronald Reagan on July 28, 1981 in the Oval Office and presented him a copy of our book, "The Men of Gambier Bay ." It was truly a memorable experience and a special tribute to our shipmates who made the supreme sacrifice on that day, October 25, 1944. God Bless. 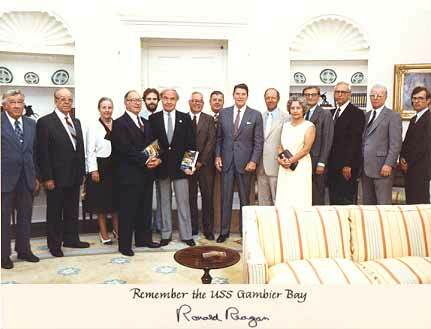 L-R: Walter Flanders, Ronnie Odum, Ruth Cuming, Al Hartin, John Cuming, Dr. Norman Loats, Bill Cuming, Jerry Fauls, President Ronald Reagan, Congressman Badham of CA., Jo Potochniak, Edward Hagerty, Tony Potochniak, Henry Pyzdrowski Sr., Henry Pyzdrowski Jr.
A painting of the Gambier Bay is presented to President Reagan. Dr. Norman Loats presents a copy of "The Men of the Gambier Bay." 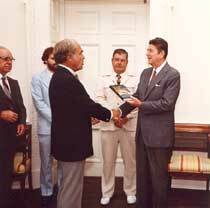 Dr. Loats was instrumental in coordinating the Association meeting and presentation with President Reagan in the Oval Office. Tony Potochniak presents a Gambier Bay - VC10 hat. Tony has served on the Board of Governors, publishes the ship newspaper "Old Shipmates", and is the organizations Historian.